Chinglish follows a Midwestern American businessman as he travels to China, desperate to score a lucrative contact for his family's firm, only to discover how much he doesn't understand. Named for the unique and often comical third language that evolves from attempts to translate Chinese signs into English, Chinglish explores the challenges of doing business in a culture whose language—and ways of communicating—are worlds apart from our own. 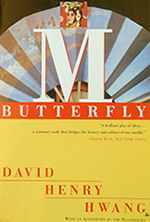 M. Butterfly is inspired by a true story of a French diplomat who carried on a twenty-year affair with a Chinese actor and opera singer, without realizing the true gender of his lover. French diplomat Bernard Boursicot and Shi Pei Pu, a Peking opera singer lived together for decades before Shi Pei Pu was discovered to be a Chinese spy and Boursicot was charged with treason. BWW Exclusive: Inside the National Asian Artists Project Gala with Baayork Lee and More!